Absolute is turning heads in Europe. Can it do the same in America? If you’re a boatbuilder who’s bent on competing in the United States, you better have two things: a lot of boatbuilding experience and a good idea of what Americans like and what they don’t. America’s financial landscape is littered with the bones of companies who entered what is generally considered the most lucrative boat market in the world without one or both of these assets. Yanks are famously tough customers. And I’ll bet a lot of you “tough customers” are looking at the boat on these pages and asking yourself, who the heck is Absolute? Such skepticism is well-founded; for even if a boat is beautiful, well designed, and properly built, no one wants to buy it if the builder might not be around in a year or two. Of course, no one can predict success or failure—especially in this economy—but one thing is certain: the people behind Absolute have a long and successful history in the boat business. The yard, which is based in the northern Italian town of Casoni, roughly midway between Genoa and Venice, is headed up by the father-daughter team of Angelo and Patrizia Gobbi, president and general manager respectively. 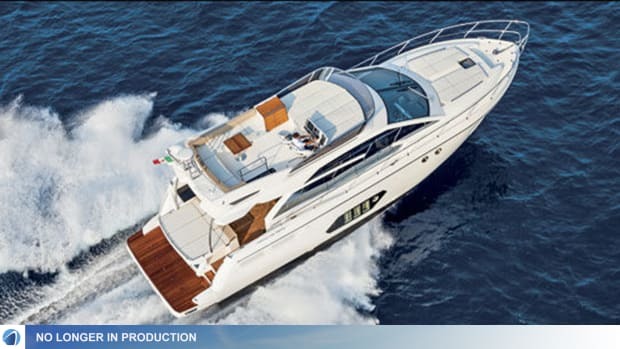 If that last name sounds familiar, it’s because they were the eponymous principals in Gobbi Marine, which Angelo started back in 1967 and sold to Azimut in 2001. While Gobbi never made it to these shores, it was a real powerhouse on the Continent. After Angelo sold the company, the pair joined Absolute, which had been started in 2002 by Marcello Be and Sergio Maggi. They quickly assumed control of day-to-day operations and, two years ago, the company moved into a new, ultra-modern boatbuilding facility. Today, Angelo is the driving force behind product development and construction while Patrizia concentrates on the marketing and sales. Both have an encyclopedic knowledge of boatbuilding, including all the latest technologies. Indeed, at the risk of punning, it’s fair to say that this builder has an absolute commitment to technology. The factory is ventilated by the latest in air-handling and air-filtration systems. All design and engineering are done on-site using 3-D modeling software and CAD, and gelcoat is applied by robots to ensure uniformity. The boats themselves are constructed using an assembly-line system that’s similar to that used by automotive manufacturers—the boats move from station to station while the workers remain in place. Of course, one reason that Absolute and its customers are such big fans of IPS is the system’s vaunted handling and maneuverability, which were both well displayed when I tested the 52 in Italy. 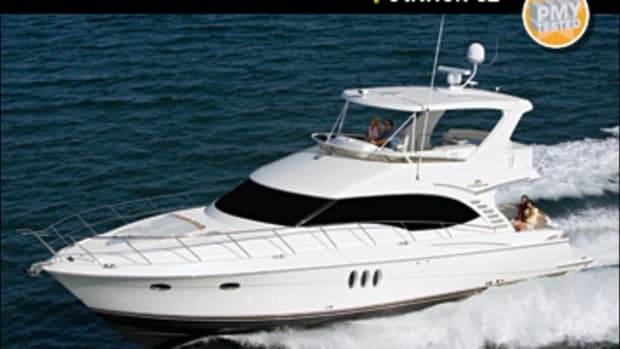 Equally impressive was the boat’s performance. 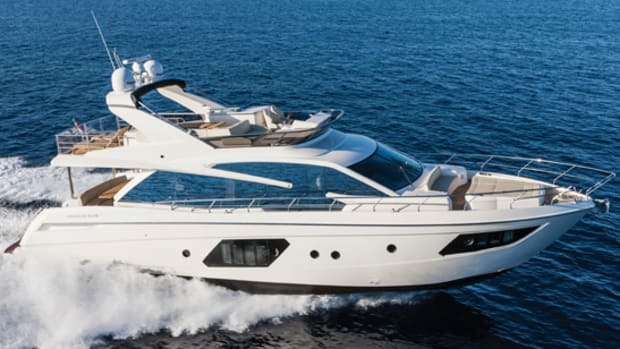 A top speed of just under 30 mph from a couple of 435-hp diesels is a thoroughly respectable performance for a boat of this size; more impressive however, is an efficiency of 0.84 to 0.80 mpg from 2000 to 3000 rpm. Among other things, that means that even with a modest fuel tankage of 423 gallons, the 52 can venture more than 300 miles before having to fill up. And despite the lack of any significant seas on test day, my 52 felt unusually solid. Credit for that goes, at least in part, to the extensive grid-type stringer system that supports the hull laminate, especially aft, in the way of the engines and drives. All this should be ample proof that the folks at Absolute know plenty about boat design and construction. But how savvy are they when it comes to discerning the tastes of American buyers? 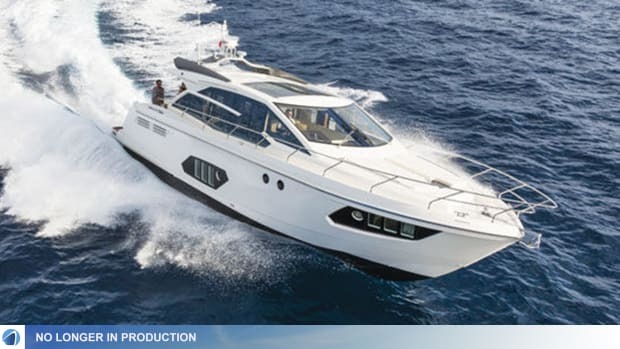 Since Absolutes have not yet been formally introduced to American buyers—they are scheduled to debut at the 2011 Miami International Boat Show—any answer to that is necessarily speculative. Clearly the 52’s layout is aimed at European tastes—understandable since that is the company’s primary market. 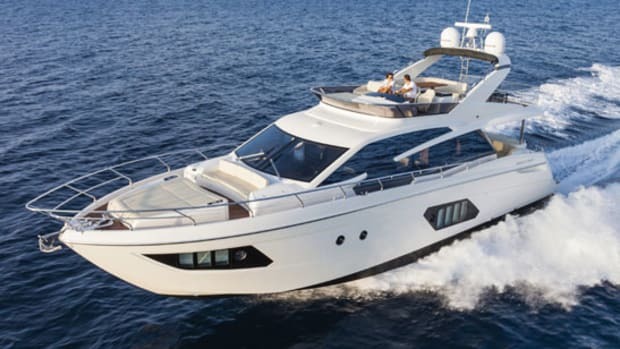 A few features, such as the inside chaise lounge to port of the helm and the pop-up TV screen that rises out of the helm console, may draw criticisms from some American buyers and, I’ll wager, changes from Absolute. Yet there’s little doubt that a lot of U.S. buyers will conclude that Absolute has gotten all of the 52’s essentials right. The emphases are on blending outside and inside spaces, providing easy access to the water, using lots of glass to bring an abundance of natural light to both the main and lower decks, and providing plenty of lounging area both in the sun and the shade. 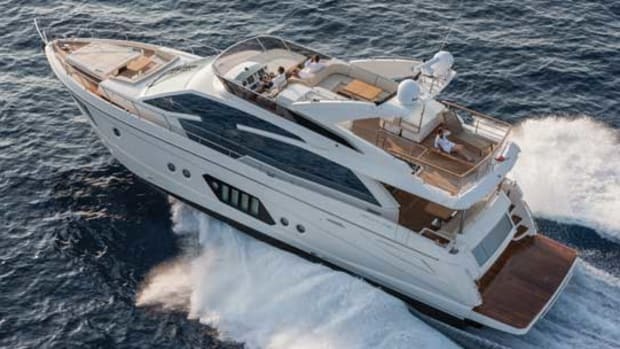 Features like a standard sunroof and overhead fixed-glass panels combine with virtually 360 degrees of glass on the main deck (artfully tinted for privacy and coolness) to impart an alfresco feel, even when the boat is shut up tight and the air conditioning is on. Which may not happen very often. With the galley aft and to port, a fully opening saloon-cockpit door, and a large cockpit table with U-shape seating, the 52 really does blur the lines between interior and exterior. But there’s more: you can order that table so that it electrically drops to convert the settee to a luxurious sunpad, and should you prefer shade for dining or relaxing but still want a lot of fresh air, an awning extends (electrically, of course) from the overhead. There’s even a fold-down serving table between the cockpit and galley to make meal prep easier and, of course, a hydraulically lowering swim platform. 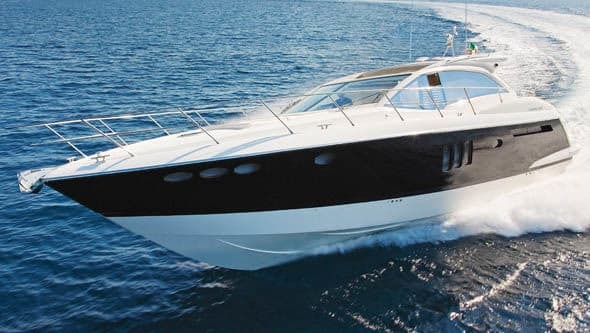 For formal or sheltered gatherings, the 52’s occupants can retire to a large main-deck saloon with a Lexan table directly to starboard of the galley. Not only is it conveniently located for dining, its base doubles as a glass and plate locker. The expanse of glass on all sides and a virtual absence of bulkheads (there’s only one in the galley to accommodate an overhead cabinet) make you feel as if you’re dining outdoors. 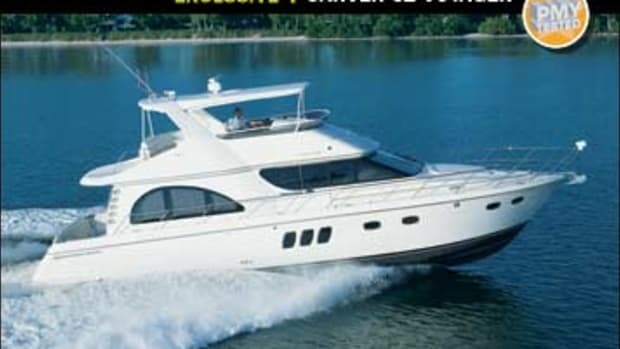 Unfortunately, it’s quite a way from the dining table’s comfortable leather couch to that flip-up TV in the helm console. Admittedly, with the galley directly across, there really isn’t a great place to put a TV without adding a bulkhead and closing off the galley. That would be a real shame since as open it is, a cook can do his thing while still being part of the action, whether it is inside or out. 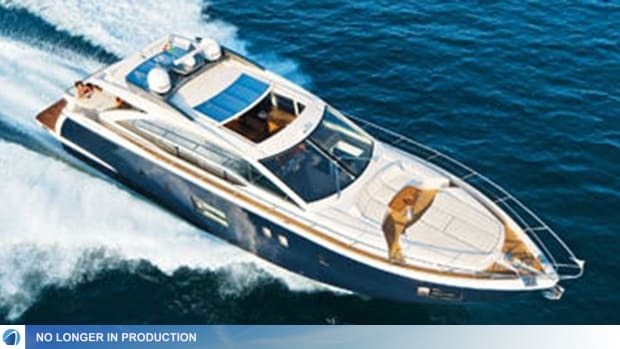 On the lower deck, the 52 shows herself to be an ideal boat for the American family. Resisting the temptation to put the master amidships, just ahead of the engine room, Absolute situated it a bit forward of the point of maximum beam; it’s to starboard of and opens onto a large atrium that services all three staterooms and lies at the foot of the main-deck companionway. The forepeak VIP is nearly identical in size while the mid-cabin, aft of the atrium, gets less headroom and twin beds—perfect for kids. All three staterooms have en suite facilities, generous headroom, and a lot of stowage, including a long closet on the port side of the atrium. 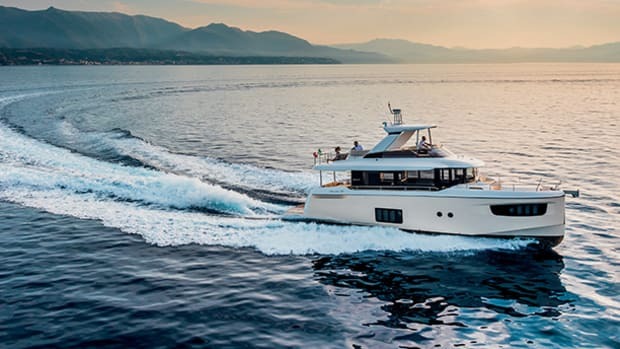 Like so many of the unusual features on the 52—including the horizontal-grain wenge joinery—the three-cabin layout manages to be different without being off-putting. Is this the kind of approach likely to attract U.S. boaters? I’d say, absolutely.